WASHINGTON, DC – DECEMBER 13: Speaker of the House John Boehner (R-OH) holds his weekly news briefing in the Capitol Visitors Center at the U.S. Capitol December 13, 2012 in Washington, DC. Boehner said that negotiations with President Barack Obama to avoid the ‘fiscal cliff’ are stalled until the White House offers more federal budget spending cuts. It’s one of the most fundamental political questions of our time: What’s driving the growth in government spending? And it has a relatively straightforward answer: first and foremost, spending on health care through Medicare and Medicaid, and other major social insurance and entitlement programs. But I thought it was worth reviewing the evidence in a bit more detail. There are a few surprises along the way, some of which liberal readers might like and others of which will please conservative readers. The Web site usgovernmentspending.com has an abundance of data on federal, state and local spending at different points in time. My focus will be on how government has been spending its money in the present and the past, rather than evaluating any future budgets or projections. I’ll be looking principally at government spending as a share of the overall economy, specifically as compared to the gross domestic product. In the long run, the overall economic health of the country is the most important constraint on fiscal policy. A growing economy gives us a lot of good choices: maintaining or expanding government programs, cutting taxes or holding them at a moderate level, reducing or managing the national debt. A stagnant economy means that everything gets squeezed. 1. Entitlement programs, under which I classify government expenditures on health care programs; pensions and retirement programs like Social Security; and welfare or social insurance programs like food stamps and unemployment compensation. 4. Infrastructure and services, under which I include everything else — the pot that is often referred to as discretionary spending: education spending; fire services, police and the criminal justice system; spending on physical infrastructure including transportation; spending on science, technology, and research and development; and the category called “general government,” which largely refers to the cost of maintaining the political system (like salaries for public officials). 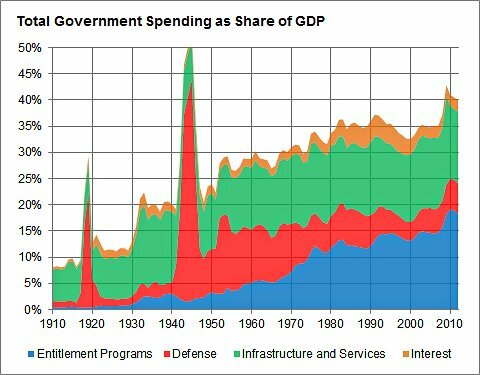 The most striking feature of the chart is the extraordinary amount of military spending during World War II (and to a lesser extent, during World War I). 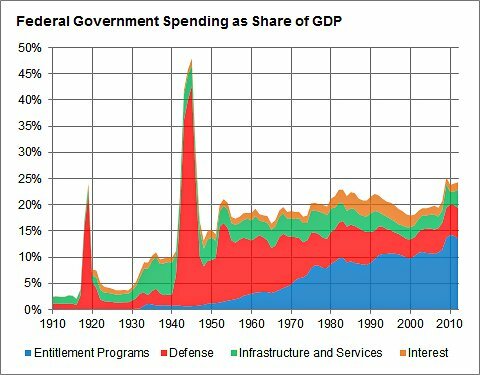 Even after World War II, however, military spending constituted the outright majority of federal government spending until 1969. Military spending makes up closer to 24 percent of federal expenditures today. That’s up from the near-term low from 1998 to 2001, when it made up about 20 percent of federal spending. (One contributor to the budget surpluses achieved briefly during the Clinton administration was a peace dividend in the interim between the cold war and the Sept. 11 attacks.) And military spending in the United States has generally been rising relative to inflation and remains very high relative to most other nations. 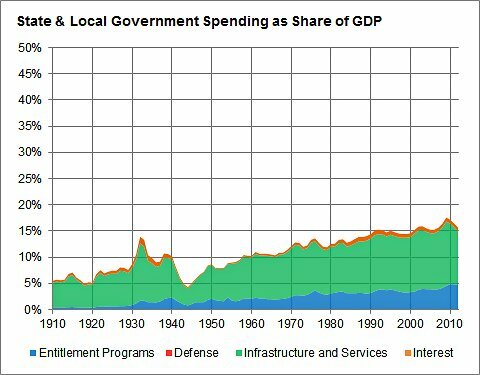 But over the longer term, it has fallen slightly relative to the gross domestic product, and substantially relative to other types of government spending. 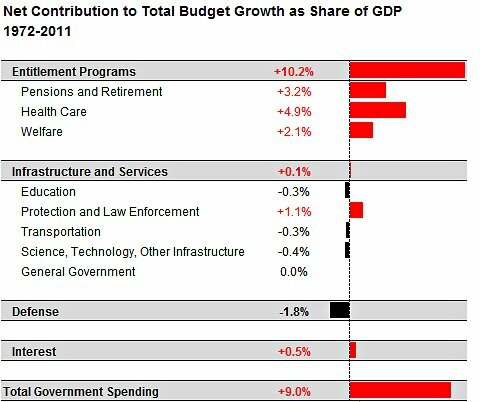 The growth in federal spending on physical infrastructure and on services provided directly by the government like policing and education, has been modest. 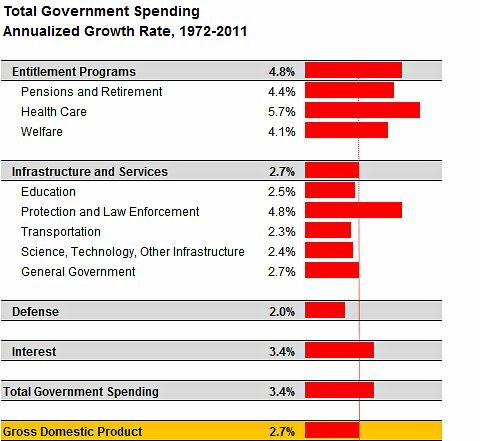 In fact, federal spending on these categories has declined somewhat as a share of the gross domestic product over the past 40 years. It might also be surprising that spending in this category is relatively quite small — federal expenditures in these areas totaled only about 2.5 percent of gross domestic product in 2011 — considering that they make up some of the most traditional functions of government (along with defense). But part of this is because many of these services are financed and provided for by state and local governments, which spend most of their money in these areas. 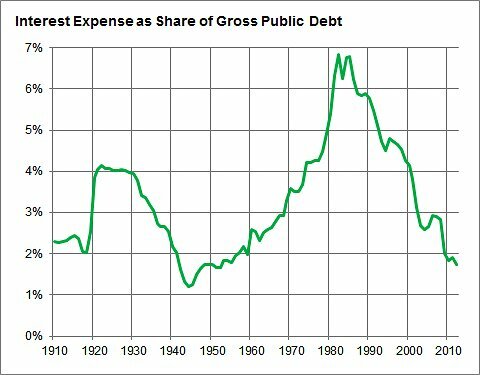 That means most of the growth in federal government spending relative to inflation — and essentially all the growth as a share of the gross domestic product — has been because of the increased expense of entitlement programs. We’ll return to this theme in a moment, but let’s first consider the role played by state and local governments. The states also spend their money much differently than the federal government: principally, as I mentioned, on infrastructure and on services like policing and education. States and localities do spend some on entitlement programs, and their expenditures in this area have been increasing, but federal expenditures have accounted for most of the growth. However, states and localities pay for essentially nothing that would be classified as military spending. They also accumulate relatively little debt, so they don’t pay much in the way of interest; many states are required by law to balance their budgets, or routinely do so as a matter of custom. The flip side is that states and localities have very limited ability to engage in stimulative spending during economic downturns. Instead just the opposite is true: recessions reduce their tax base, so they either have to increase tax rates or cut services to keep their budgets balanced. The federal government provided various grants to the states in the stimulus package it passed in 2009, offsetting some of the states’ expenses, but these programs have since largely expired, and many states and municipalities have had to cut their budgets or raise taxes since then. Partly as a result, about 500,000 local and state government jobs have been lost since 2009, even as private-sector employment has (somewhat) recovered. about what is driving the increase in spending relative to gross domestic product entitlement programs, which account for the vast bulk of it. 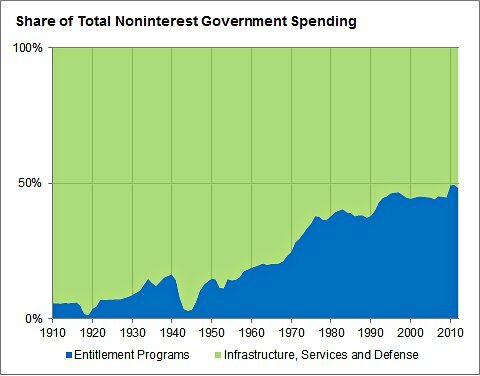 The usgovernmentspending.com data classifies three subcategories of entitlement programs. Spending on welfare programs like food stamps and unemployment insurance is the most cyclical – or technically the most countercyclical, since much of it kicks in automatically during an economic downturn. Spending on retirement programs, principally Social Security, is the steadiest, but it has been increasing faster than the rate of gross domestic product growth and considerably faster than inflation. And health care spending has been increasing at the fastest rate. 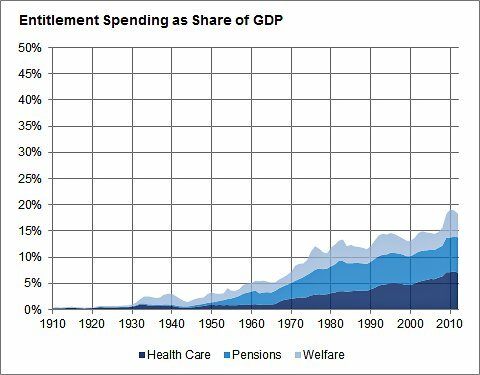 Specifically, overall government spending on entitlement programs increased at a 4.8 annual rate in the 40 years between 1972 and 2011, net of inflation. Health care spending increased at 5.7 percent per year (and federal government spending on health care increased at a 6.7 percent pace). In contrast, the gross domestic product grew at a rate of 2.7 percent over this period, with tax revenues increasing at about the same rate as the G.D.P. And soon, we may cross an important symbolic threshold: when the overall majority of government expenditures are spent on, essentially, insurance programs. (Another way to conceive of the major categories of entitlement programs are as health insurance, retirement insurance, unemployment insurance and so forth). Already, this is true of federal government spending (and it has been true since the early-to-mid-1990s). It is very close to being true even if one also accounts for state and local spending, and may well become true as soon as this year. Slowing the growth of entitlement spending will not be easy. Particularly in the case of health care, it has become substantially more expensive for individuals with both public and private insurance to purchase the same level of care. And on a political level, cuts to entitlement programs are liable to be more noticeable to individual voters than cuts to things like infrastructure spending. A 10 percent cut to Social Security or Medicare benefits will surely draw the ire of voters. A 10 percent reduction in the amount allocated to bridge repair, or in the amount of government-sponsored energy research, will affect individual citizens less directly (even if they are perhaps ultimately more economically damaging: most of the academic literature is supportive of high long-run returns to infrastructure and research and development spending on private-sector productivity and economic growth). A version of this article appears in print on 01/17/2013, on page A16 of the NewYork edition with the headline: Health Care Drives Increase in Government Spending.